This entry was posted in BBQ on May 29, 2017 by The Original Flame Author. I’ve owned and used a Saber gas grill at home for a year now and the biggest benefit I’ve experienced from owning a Saber gas grill has been fearless cooking, what that means to you, is no worries about flare ups, uneven cooking and juicy meals! Because of the Saber gas grill’s true infrared cooking (more on that later) if you do your part in the grilling process, there’s almost no way to end up with charred, burnt food or half cooked food. 1) True infrared cooking. With the Saber system of emitters over cooking grills, which means that the burners of the grill are completely covered and protected, you just don’t see flare-ups with the Saber gas grill. You see smoke, you don’t see a flame. I frequently cook bone-in chicken, pork, chicken wings, the greasiest frozen burgers around – and I’ve never ended up with a grease fire. 2) Build quality. The Saber gas grill is so well built. The lid is nice and heavy – and on the model that I own, it’s a double skinned lid, perfect for winter grilling (the double skinning helps retain some of the heat produced by the grill during the cooking process). 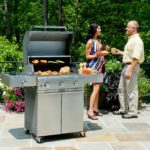 The grill is made of commercial grade 304 non-magnetic stainless steel, which means that you won’t have to worry about rust or deterioration like you do with big box store grills. The model that I own weighs more than two hundred pounds and if we’re heading to a homeshow, we find that three reasonably sized helpers make it possible to load the grill into the back of a pickup truck. 3) Because the burners are each in their own compartment, you can light just one burner and grill something without lighting the whole BBQ. 4) The Saber gas grill uses 30% less fuel than other grills similar in size from other manufacturers, which means that you will save money on fuel! 5) The warranty. 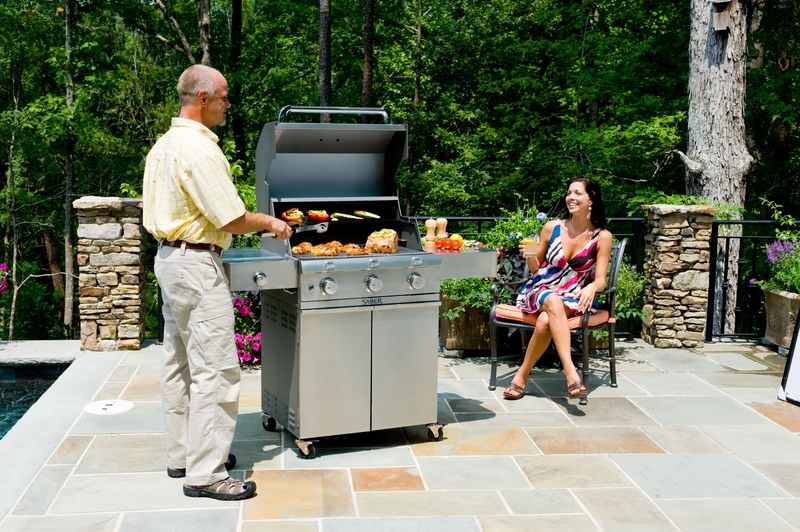 With a ten-year warranty on the burner tubes and carryover tubes and a five-year warranty on the cooking grates, emitters and warming racks, you feel a great deal of reassurance that A) the build quality is high enough that the manufacturer is comfortable with warranty periods that long and B) that as a consumer, you’re protected from the annoyance of needing to deal with getting parts for a BBQ – and if you have to, that they’re going to be covered under warranty. 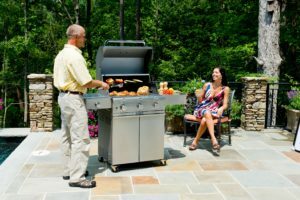 With any grill in the $1000-$2000 price range, the consumer should feel that they’re working with a well-backed product. 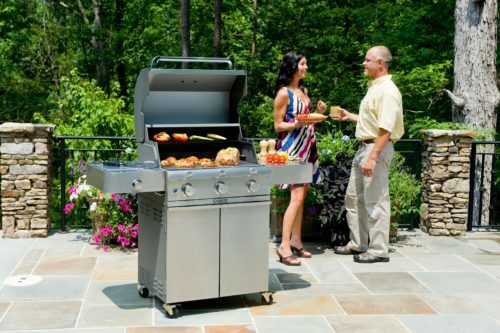 With the Saber gas grill, any issues, any concerns, any need for technical support or pointers, you’ll deal with us here at The Original Flame, and we’ll make sure that you’re totally pleased with your Saber grill, feel confident cooking with it and have a great understanding of the value that a Saber grill offers. Please feel to fill out our website contact form or give us a call anytime in connection with the grill and any questions you may have, or stop by the showroom to see it in action.